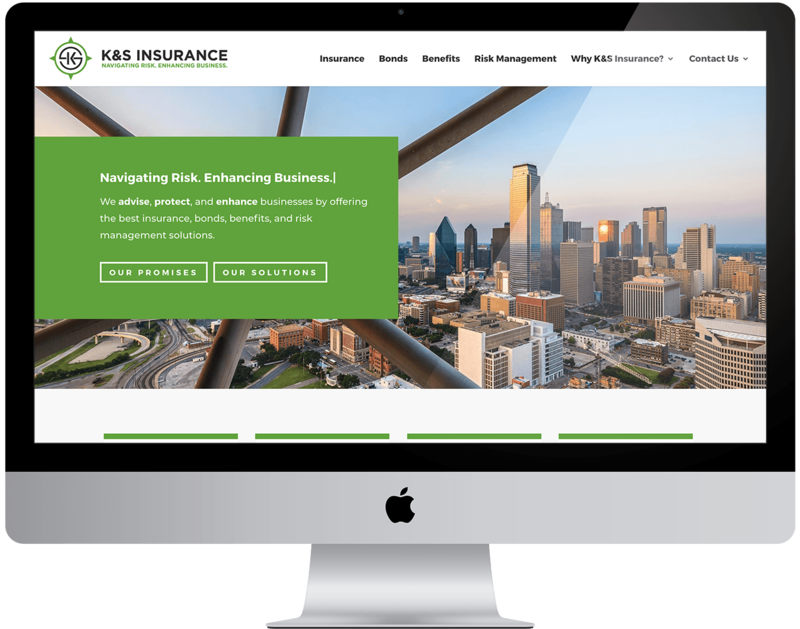 K&S Insurance is a commercial insurance provider headquartered out of Rockwall, TX with offices in El Paso, Lubbock, and Leander. 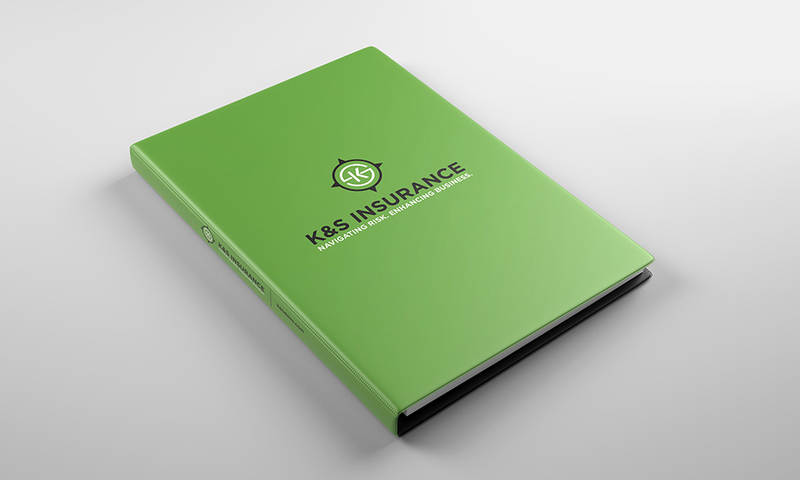 With 40+ years of experience and dozens of trusted advisors, K&S is a leader in the commercial insurance space. The team at K&S was great to work with. 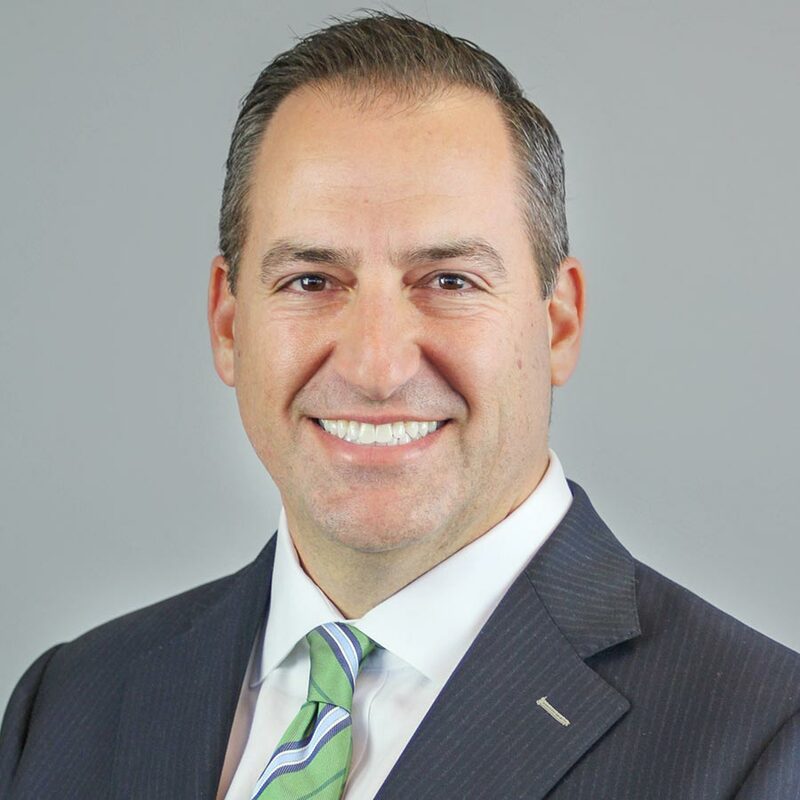 They were genuinely passionate about serving their clients and providing them with solutions to their problems. Through multiple meetings and employee interviews, we helped K&S discover and verbalize five core values that guide them. We call them their Promises: build lasting relationships, do what’s right, help others win, give back generously, and always be learning. This new language has helped their unite their employees, and provided inspiration to their customers. 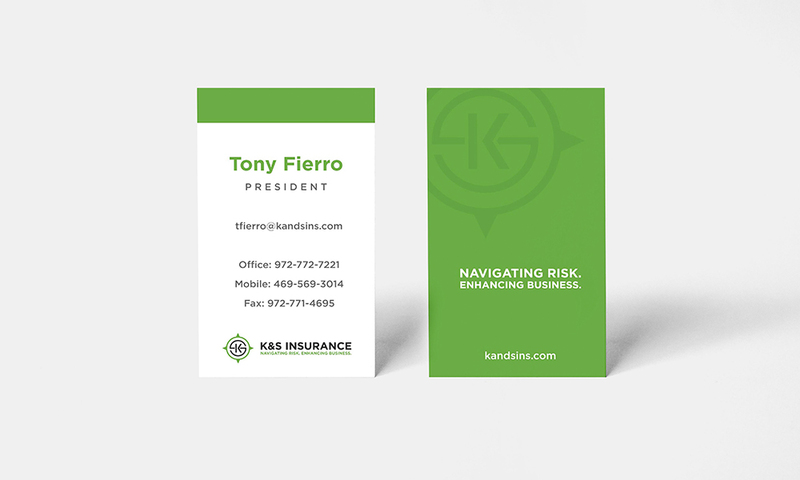 We’re grateful for the opportunity to partner with K&S to better tell their brand story. The original K&S logo (seen to the right), was dated and rigid. It lacked personality and failed to accurately tell the K&S story. Additionally, there were several different variations of this logo floating around on signage and print pieces that resulted in some brand confusion for their customers and stakeholders. Check out the original logo to the right and our revised version below. In addition to simplifying their brand, we wanted to create a mark that more accurately portrays their organization. The logo is comprised of a “compass” icon and a word mark. 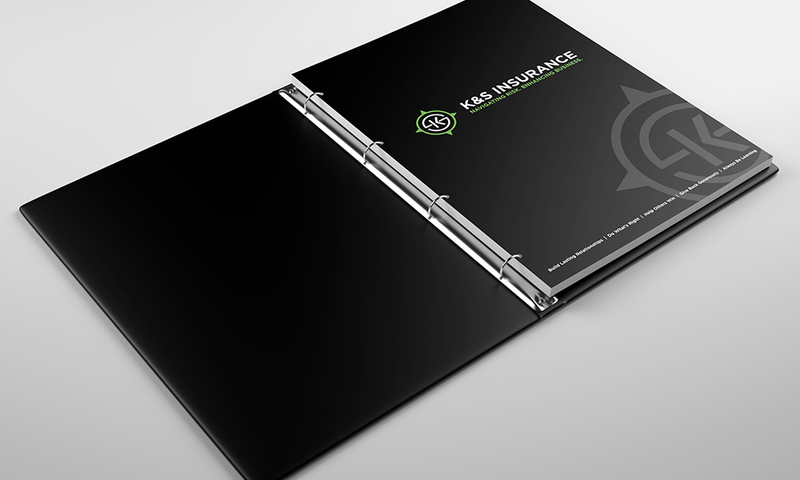 The compass represents the idea that K&S doesn’t just help their customers avoid risk, they actually help them navigate risk while guiding the organization to the best insurance solutions. The green in the color palette stands for growth. K&S partners with their clients to help grow and enhance their businesses. 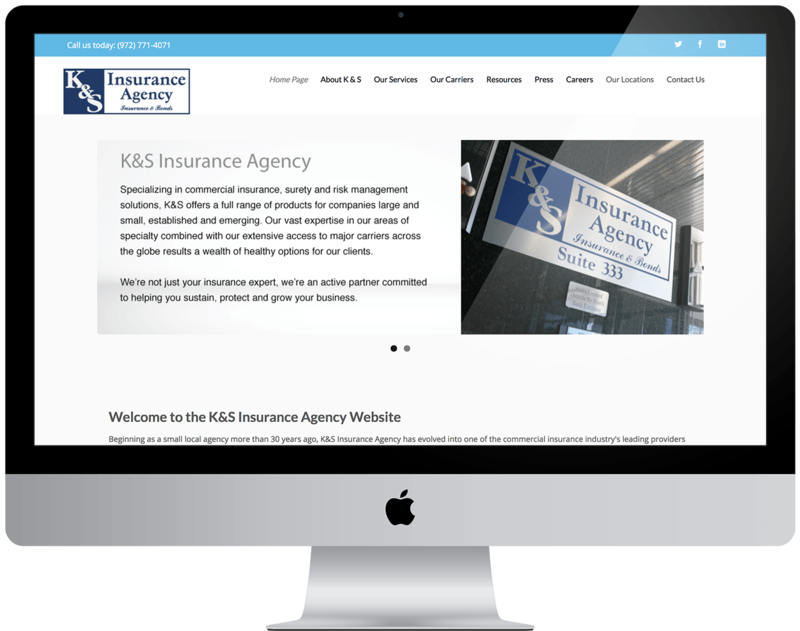 A huge goal for the new K&S website redesign was to drastically improve navigation and usability. We clearly structured the website into the four services they provide and utilized the strong messaging that we had created for them. The result was a powerful website that is easy to navigate and looks great. We also made everything mobile-friendly so the new website looks just as great on mobile as it does on desktop. Check out the full site by clicking here. 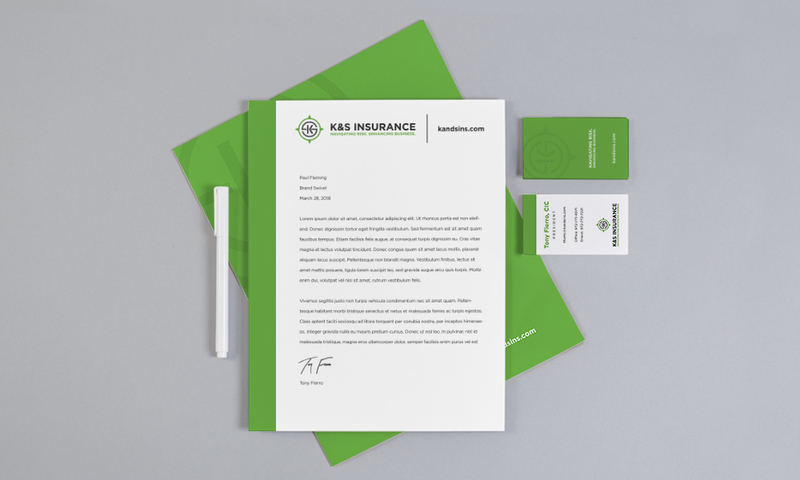 In addition to the logo and website, we also had the opportunity to provide K&S with several new pieces of print collateral for their new brand, including: letterhead, business cards, thank you cards, envelopes, binders, folders, mailing stickers, and branded polos and vests for their staff. We designed and printed each of these pieces for K&S.